Tobacco Road, originally established as Charlie’s Tobacco Road in 1942, will be closing it’s doors for the last time the morning of October 26, 2014. The structure, located at 626 South Miami Avenue, south of the Miami River, will inevitably be demolished for high-rise development. Many stories have been told about The Road, but not many are historically accurate. There isn’t a record of a structure on the existing lot until 1915, and at the time it was listed as a bakery. It was home to several bakeries between then and 1937, when it is rumored to also be home to a speakeasy during the time of Prohibition. 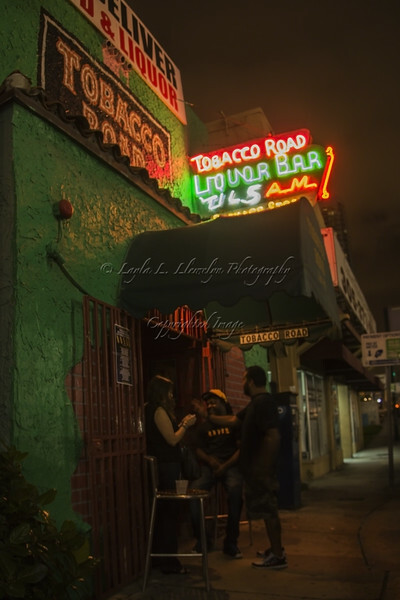 In 1938 it first became a bar (South Side Bar), and property changed ownership and names several times, while developing quite a reputation as a place frequented by the “morals squad” of the Miami Police Department. Whatever part of the lore is actually true (first liquor license in the City, oldest bar, gambling lounge frequented by Al Capone), it will be missed for its rich and colorful stories and century old secrets locked in the pores of its structure. Farewell Tobacco Road.